Since the last Report on Progress Toward Security and Stability in Afghanistan was released in April 2011, the International Security Assistance Force (ISAF) and its Afghan partners have made important security gains, reversing violence trends in much of the country (except along the border with Pakistan), and beginning transition to Afghan security lead in seven areas. Continued military pressure through partnered operations has allowed joint ISAF-Afghan forces to maintain and expand the security gains made during the previous year, disrupting insurgent safe havens and command and control structures, and expanding security for the Afghan population. The Afghan National Security Forces (ANSF) have been integral to this success, demonstrating substantial growth in quantity, quality, and operational effectiveness. Although security continues to improve, the insurgency’s safe havens in Pakistan, as well as the limited capacity of the Afghan Government, remain the biggest risks to the process of turning security gains into a durable, stable Afghanistan. The insurgency remains resilient, benefitting from safe havens inside Pakistan, with a notable operational capacity, as reflected in isolated high-profile attacks and elevated violence levels in eastern Afghanistan. Nevertheless, sustained progress has provided increased security and stability for the Afghan population and enabled the beginning of transition in July of security responsibilities to Afghan forces in seven areas, comprising 25 percent of the Afghan population. The most significant development during this reporting period is the reduction in year-over-year violence. 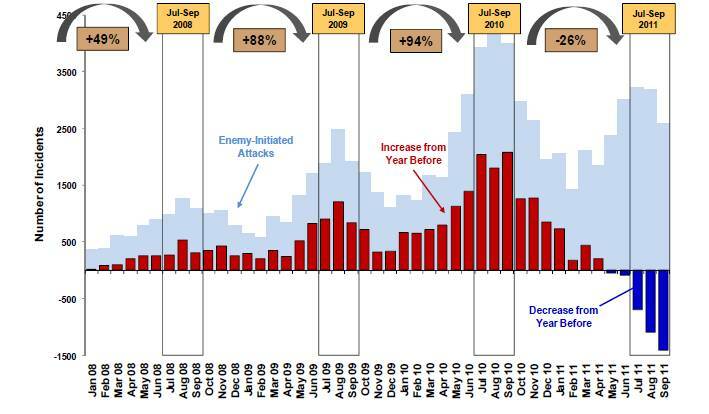 After five consecutive years where enemy-initiated attacks and overall violence increased sharply each year (e.g., up 88 percent in 2010 over 2009), such attacks began to decrease in May 2011 compared to the previous year and continue to decline (Figure 1). Joint military progress throughout the country enabled the commencement of transition to Afghan security lead during the reporting period. Led by the Afghan Government and in close cooperation with the United States and international community, seven areas, including the major cities of Kabul, Herat, and Mazar-e-Sharif, began the transition process to Afghan security lead in July. Transition remains on track with no demonstrated effort by the insurgency to target the process. As the transition process continues, the ANSF will gradually assume the lead for security responsibility throughout the country, and the Afghan Government will continue to increase capacity with governance and development initiatives. Discussions are currently ongoing to designate the areas that are expected to begin transition in the next tranche. Also during the reporting period, President Obama announced that recent security progress and the increasing capacity and capability of the ANSF have allowed for the recovery of U.S. surge forces. Ten thousand U.S. troops will be redeployed by the end of the 2011, and the entire surge force of 33,000 personnel will be recovered by the end of September 2012. Approximately 68,000 U.S. troops, however, will remain in Afghanistan following the drawdown, and ISAF is currently developing a recommendation for future force levels. Although force levels will gradually decrease, the United States remains committed to the long-term security and stability of Afghanistan, and negotiations are progressing on a long-term strategic partnership between the United States and Afghanistan. The successful May 2, 2011 raid against Osama bin Laden also took place during the reporting period. This was an important achievement for all partner nations engaged in Afghanistan and sent a signal to all, including the Taliban, that the United States is committed to achieving its objective, which is to disrupt, dismantle, and eventually defeat al Qaeda and its affiliates, and to prevent their return to either Afghanistan or Pakistan. Nevertheless, the effect that this operation has had on U.S.-Pakistani relations, particularly cross-border cooperation, should not be underestimated. The security gains highlighted in the previous edition of this report – enabled by the surge in ISAF and Afghan forces throughout 2010 – have been sustained and expanded during the reporting period. ANSF-ISAF success in consolidating security gains in previously-cleared areas confirms that the civil-military counterinsurgency (COIN) strategy has significantly degraded the insurgency’s capability, particularly in Helmand and Kandahar. ANSF-ISAF operations have widened the gap between the insurgents and the population in several key population centers, limiting insurgent freedom of movement, disrupting safe havens in Afghanistan, and degrading insurgent leadership. Continued, partnered COIN operations by ANSF and ISAF forces, complemented by partnered Special Forces targeting of insurgent leaders, have reduced enemy attacks and violence in Regional Commands Southwest, West, and North. Overall, year-to-date enemy attacks nationwide were five percent lower than the same period in 2010, and attacks continue to decline. During the reporting period, ANSF-ISAF operations remained focused on southern and southwestern Afghanistan, the heartland of the Taliban-led insurgency. Regional Command Southwest produced the most dramatic security progress during the reporting period, as COIN operations expanded gains in central and southern Helmand Province by disrupting insurgents’ freedom of movement, limiting their access to the population, and eliminating key supply routes. In Regional Command South, Afghan and coalition operations consolidated gains from Operation HAMKARI, with a particular focus on the Highway 1 corridor. Insurgent momentum was also reversed in Regional Commands North and West, where the insurgency had conducted supporting operations during 2009 and 2010 in an effort to divert ISAF resources and attention away from operations in the south. However, in 2011, increasingly effective partnered military operations reversed insurgent gains made in the previous two years, reducing violence and enemy attacks and beginning the process of expanding ANSF-led security into contested areas. The security situation in Regional Command East, however, remains tenuous. Cross-border incidents have risen during the reporting period as a result of the sanctuary and support that the insurgency receives from Pakistan. In Regional Command Capital, the ANSF has established a layered defense system in and around Kabul, which has resulted in improved security, and the ANSF continues to respond effectively to threats and attacks. Nevertheless, Kabul continues to face persistent threats, particularly in the form of high-profile attacks and assassinations. The ANSF remains a key element to the long-term security and stability of Afghanistan. During this reporting period, the Afghan National Army (ANA) and Afghan National Police (ANP) continued to develop into capable security providers, improving in quantity, quality, and operational effectiveness. In order to support the transition process and ensure security gains are sustainable, the Afghan Government approved an increase in force end-strength in June from a planned strength of 305,600 personnel (171,600 ANA and 134,000 ANP) by October 2011 to 352,000 personnel (195,000 ANA and 157,000 ANP) by October 2012. As of the end of this reporting period, the ANA reached 170,781 soldiers and the ANP reached 136,122 policemen; both the ANA and ANP remain on track to achieve their respective growth goals for October 2012. As the ANA and ANP achieve their growth targets, ISAF and the Afghan Government are placing an additional emphasis on force professionalization as well as the development of key enabler and logistics capabilities. During the reporting period, the ANSF literacy training program produced its 100,000th graduate, and the last of the twelve ANSF branch specialty schools opened in May. Further, the Afghan Government continues to improve its ministerial and institutional capacity, as evidenced by the nomination of two departments – one each from the Interior and Defense Ministries – to begin the transition process to independent operations. Force growth and professionalization efforts are translating into a more capable and effective ANSF. ANA effectiveness improved, as the number of units rated “Effective with Assistance” or better rose from 52 percent of units in September 2010 to 72 percent of units in September 2011. The ANP also made significant progress during the reporting period; for example, operational effectiveness in the Afghan National Civil Order Police improved significantly, as 70 percent of kandaks3 were rated “Effective with Assistance” or better in September 2011, up from 40 percent in September 2010. These improvements have enabled the ANSF to assume greater responsibility throughout Afghanistan, as indicated by the increase in ANSF-led operations during the reporting period. Notably, the ANA initiated the first Afghan-led, kandak-level operation in Helmand Province in July, effectively complementing ISAF clearance operations in several districts in the Central Helmand River Valley. Even with this progress, the growth and development of the ANSF continues to face challenges, including attrition above target levels, leadership deficits, and capability limitations in the areas of staff planning, management, logistics, and procurement. The ANSF continues to require enabling support, including air (both transport and close air support), logistics, ISR4, and medical, from coalition resources to perform at the level necessary to produce the security effects required for transition. The influence of criminal patronage networks on the ANSF also continues to pose a threat to stability and the transition process. Further, the drawdown of U.S. and international forces increases the risk of a shortfall of operational partnering resources, which could reduce ANSF-ISAF operational partnerships and may impede ANSF development. ANSF-ISAF operations continue to reduce the influence and operational capacity of the insurgency. The disruption of safe havens within Afghanistan, the significant loss of low- and mid-level insurgents, and the disruption of command and control structures have largely stunted the Taliban’s spring and summer campaign, preventing it from achieving a significant strategic effect on security conditions throughout the country. The effective interdiction of supplies and the reluctance of some Pakistan-based commanders to return to Afghanistan contributed to the insurgents’ failure to mount the level of operations that they had planned and that ISAF had expected. However, the Taliban-led insurgency remains adaptive and resilient with a significant regenerative capacity. As insurgent capacity to contest ANSF-ISAF gains erodes, insurgents have turned to asymmetric efforts in order to avoid direct engagement with ISAF and ANSF forces, including the increased use of improvised explosive devices (IEDs), high-profile attacks, and assassinations of Afghan Government officials. These tactics require less infrastructure in Afghanistan and do not need the support of the Afghan people; however, they do require command and control, training, and logistics support from safe havens, which the insurgents have in Pakistan. For example, IED material storage and construction facilities formerly based in Afghanistan have now been moved to Pakistan, specifically in the border town of Chaman, Baluchistan Province. The assassinations and attacks directed from the safe havens in Pakistan – especially the Federally Administered Tribal Areas of North Waziristan and the settled area of Chaman – while reflecting the weakness of the Taliban in Afghanistan, have the potential to have a significant political effect in Afghanistan as well as coalition countries. With the continued disruption of key insurgent safe havens in Afghanistan, safe havens in Pakistan have become the most important external factor sustaining the insurgency, and continue to present the most significant risk to ISAF’s campaign. The comprehensive, civil-military COIN strategy continues to expand security for the Afghan population, providing the necessary conditions for the Afghan Government to extend effective governance and promote economic and social development. During the reporting period, the Afghan Government continued to build the human capital necessary to establish effective governance throughout the country. Successful job fairs in Ghazni and Kandahar recruited hundreds of new civil servants to fill important district- and provincial-level positions in the Afghan Government. Additionally, considerable progress was made in the provision of basic services and infrastructure: electricity consumption continues to increase, several new health facilities became operational, and new government-run vocational education centers are providing job training across the country. However, the capacity of the Afghan Government has been limited by a number of issues, including the political dispute in the Lower House of the Afghan Parliament, the continued absence of an International Monetary Fund program, widespread corruption, and the lack of political progress in enacting key reforms announced at the July 2010 Kabul Conference. Setbacks in governance and development continue to slow the reinforcement of security gains and threaten the legitimacy and long-term viability of the Afghan Government. The United States and the international community continue to work closely with their Afghan partners to address these challenges. Security gains during the reporting period have provided a firm foundation for the transition of security responsibilities to the Afghan Government and the ANSF. The ongoing success of the civil-military COIN campaign has degraded the Taliban-led insurgency, limiting their operational capacity and undermining their popular support. The ANSF-ISAF partnership remains integral to security progress, as the Afghan Army and Police continue to translate training into operational effectiveness. Nevertheless, the insurgency remains resilient and, enabled by Pakistani safe havens, continues to contest ANSF and ISAF progress throughout the country, particularly in eastern Afghanistan. Although the security situation continues to improve, the Afghan Government must continue to make progress toward key governance and development initiatives in order for security gains to become sustainable. Finally, even as U.S. surge forces draw down over the next year and as the transition process continues, the mission and strategy remain unchanged, and the United States and its coalition partners remain committed to achieving long-term stability and security that will ensure Afghanistan never again becomes a safe haven for al Qaeda or its affiliates. 1This report is submitted consistent with Section 1230 of the National Defense Authorization Act for Fiscal Year 2008 (Public Law 110-181), as amended. It includes a description of the comprehensive strategy of the United States for security and stability in Afghanistan. This report is the eighth in a series of reports required every 180 days through fiscal year 2014 and has been prepared in coordination with the Secretary of State, the Office of Management and Budget, the Director of National Intelligence, the Attorney General, the Administrator of the Drug Enforcement Administration, the Administrator of the United States Agency for International Development, and the Secretary of Agriculture. This assessment complements other reports and information about Afghanistan provided to Congress; however, it is not intended as a single source of all information about the combined efforts or the future strategy of the United States, its coalition partners, or Afghanistan. The information contained in this report is current as of September 30, 2011. NOTE: This is a historical document that covers progress in Afghanistan from April 1, 2011, to September 30, 2011. The next report will include an analysis of progress toward security and stability from October 1, 2011, to March 31, 2012. 2 The faded blue bars in the background depict monthly enemy-initiated attacks. 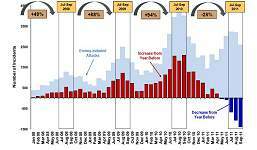 The full-color red and blue bars represent the difference in attacks for the same month in successive years. For example, the last full-color blue bar is the difference between attacks in September 2011 compared to those in September 2010. The rectangular text boxes highlight the most recent three-month period, and equivalent periods in previous years. The arrows and figures show year-over-year change in attacks for the period July to September 2011.